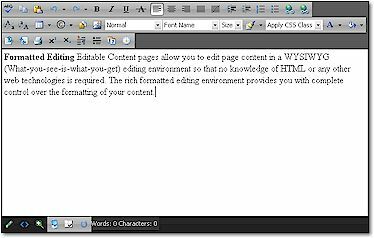 Formatted Editing Editable Content pages allow you to edit page content in a WYSIWYG (What-you-see-is-what-you-get) editing environment so that no knowledge of HTML or any other web technologies is required. The rich formatted editing environment, which includes image management and resizing the editing window to as much as full-screen, provides you with complete control over the formatting of your content. Spell Checking The Editable Page template provides a fully integrated spell checker that allows you to maintain your own dictionary. This way you don't have to worry about embarrassing typos. Content Review and Publishing Authorized users can review updated content before it is published out to the public. When you're satisfied with the content, a simple click of a button makes that information accessible to the public. Full Content Management is Available Of course, your can always rely on our professional staff to manage your content for you.